Your new outdoor TV will typically ship 1-2 business days after your order is placed. Sealoc and GoVisionTVs are the exceptions as Sealoc takes around 2-3 weeks before they're shipped and a GoVisionTV takes around 75 days to build before they're shipped. Free shipping for all TVs usually takes around 5 business days. Expedited shipping is available upon request for an additonal fee. Yes. We ship SunBriteTVs, All Season TVs, Peerless-AV TVs, Séura TVs, Samsung TVs, GoVisionTVs and MirageVision TVs to Canada. 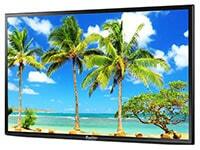 Sealoc TVs however cannot be shipped internationally. There is a 10% fee for all orders shipped to Canada. Buyers in Canada will also be responsible for paying any applicable duties. Yes. We offer both 0% APR for 12 months and 14.99% APR for 6-60 months. All you have to do is click the "Apply" button on a product page or if you'd like to purchase multiple items, you can complete the form here. Please note that we'll only be able to send your order to the address used in your financing application. If you have any questions, please feel free to contact us. What are the benefits of using an outdoor TV ouside over an indoor TV? • View the top 10 reasons why you should use an outdoor TV ouside HERE. What's the difference between each of the brands you sell? All of these TVs are built to be outdoors, however they have all taken a slightly different path to get there. SunBriteTV builds a weatherproof TV from the ground up. From the very beginning, these TVs are destined to live outside. They also have the widest variety of TVs, from residential TVs intended for shaded areas, to super bright commercial grade TVs with protective glass covering the screen. All Season Outdoor TVs are built specifically for the outdoors. They are tested in a wide variety of harsh elements to ensure they can withstand anything they may have to endure. Most of their models have bright 1500 NIT screens, which are over 3 times brighter than comparable outdoor TVs. They also come with a 2 year warranty for peace of mind. Peerless-AV also builds their weatherproof TVs from the ground up. They are built specifically to be used outside. Like SunBriteTVs, they feature a rugged aluminum enclosure. Their brightness is in between the SunBriteTV Veranda Series and the SunBriteTV Signature Series. Samsung is no doubt a household name for a variety of consumer products, however you may not have known they also build commercial grade outdoor displays. These displays are industrial quality and have the longest commercial grade warranty available (3 years). They feature a powder-coated steel enclosure and can last for many years - in any outdoor environment - operating 24/7/365. They also have built-in WiFi and digital signage management hardware and software. Séura has become an award-winning TV manufacturer offering a full, and constantly evolving, portfolio of mirror and TV solutions with applications in every indoor and outdoor space. Throughout the Séura journey, technology has drastically evolved and become an even larger and more integrated part of everyday life. With that, Séura’s vision has evolved as well. Instead of bridging the gap between design and technology Séura is focused on eliminating it. Working to find the perfect harmony of design and technology in every product and project so that every individual gets the most from every space they're in. Sealoc and MirageVision TVs are indoor TVs that have been rebuilt and re-engineered to withstand the harsh elements of the outdoors. These are brand new TVs, however they are taken apart, treated, weatherproofed and rebuilt. Both of these brands also add a protective weatherproof coating on all internal components of every TV. The main differences between these two are MirageVision TVs always include a dust cover and usually ship within 2 days. Sealoc TVs do not include a dust cover and typically take 2 weeks before they ship. Sealoc TVs also usually cost a little less. GoVisionTVs are gigantic stadium style displays that will bring any backyard or entertainment venue to life! Their sizes range from 115" to 317", so if you need to make a statement, GoVisionTVs are the way to go. They also have a 5500 NIT brightness, so they're almost double other "high bright" commercial grade TVs. Have another question? Please don't hesitate to ask.